Art – Why is Mona Lisa Smiling? Just in case you’ve ever wanted to know, my middle school art class figured out why Mona Lisa smiles! I got the original idea here. Basically, I found some high-resolution pictures of the Mona Lisa online. Cropped her face and hands, reduced them in size, and copied them on our copy machine at the school. Before the assignment, the kids and I went over different things that make us happy, and we made a list. I revealed to them that they were going to have to put Mona Lisa in that situation, and they were pretty excited about it. Mona Lisa loves being Santa! Mona Lisa loves being a Pilgrim! Mona Lisa loves riding roller coasters! Mona Lisa loves being the Avatar! Mona Lisa loves scuba diving! Mona Lisa loves video games! Mona Lisa loves to read! Mona Lisa loves being an astronaut! One of the things I love about the older students is their cognitive abilities. Although many of them haven’t had a formal art class, they are old enough to where most of them have taken the initiative to start drawing and such on their own. Just simply doodling helps them have the motor skills and recognition of terms. 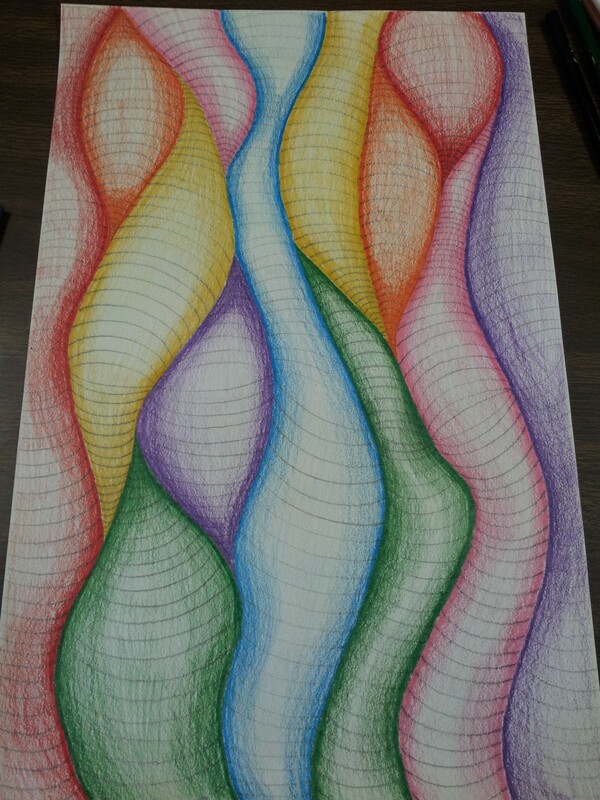 For this project, I wanted to give them a taste of op art. It was a simple idea, and almost everyone finished it within one class hour. 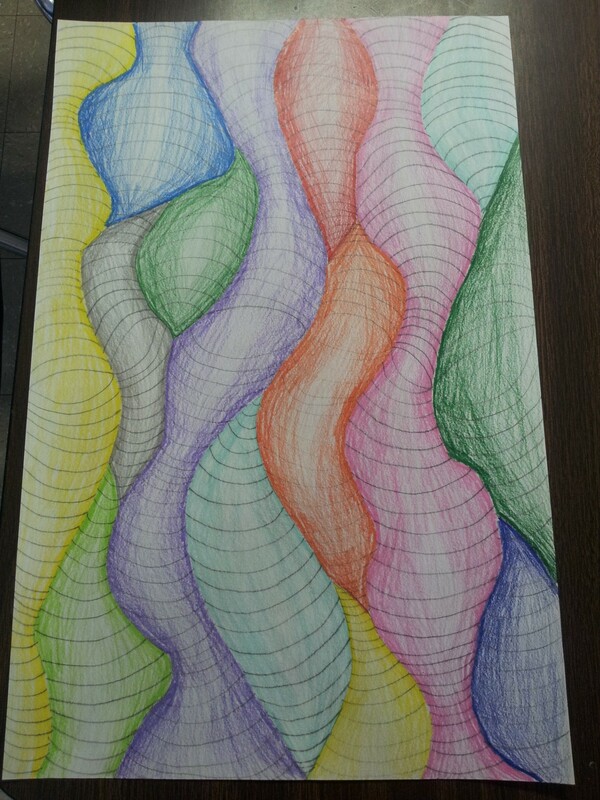 Fist, the students drew a horizontal, wavy line in the middle of the paper. 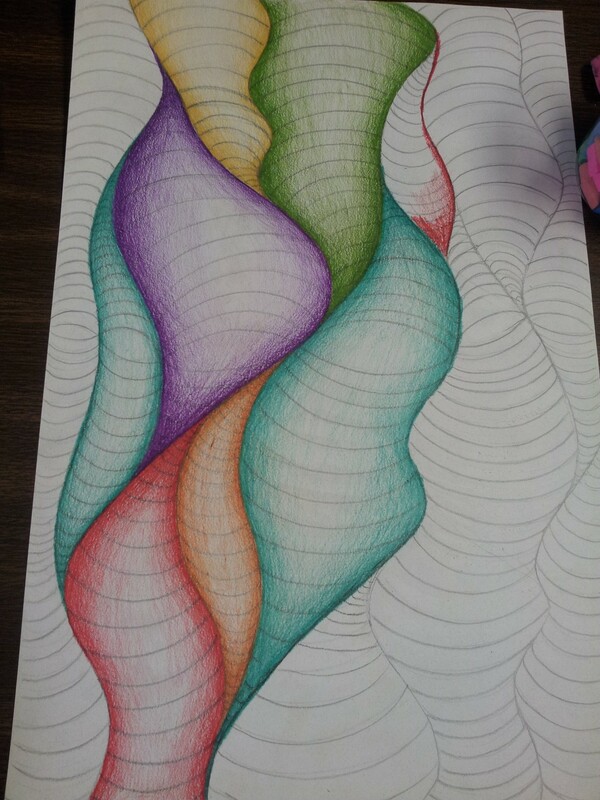 Then they drew vertical, wavy lines; not all of them went from top to bottom. They followed the “flow” of the lines to determine where to add the next line. After that, the students made semi-circles above and below the horizontal line. This gave it the appearance of a bubbled or swollen effect. To add to this. they used colored pencils to color the “bubbles.” They made sure to keep the center lighter than the edges. Partially done, so you can see the original lines. Warm and cool colors making a beautiful piece of art! I got this idea from here. I had to buy the template, and then I made copies onto cardstock. The children were instructed to have someone else at their table draw around their hand lightly in pencil. Then, with colored pencils, they colored in the hand using only warm colors, specifically red, orang, and yellow. We talked about complimentary and contrasting colors, and I had a picture of the colorwheel on the board for them to use as a reference. 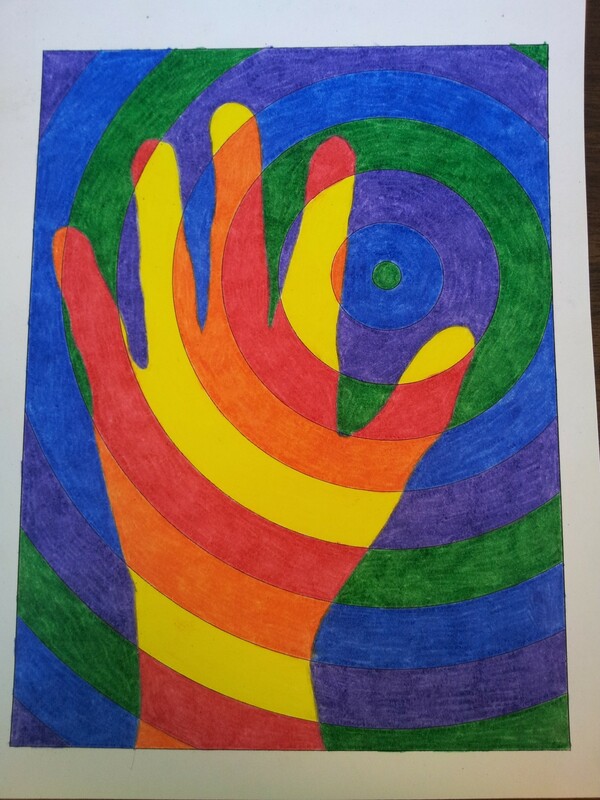 After they colored the hand, they started on the outer rings, making sure to match up colors, like on the color wheel: orange to blue, red to green, and yellow to purple. They turned out looking great, and it was a fairly easy project.